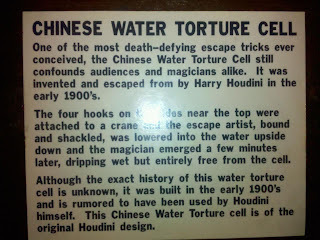 Today, September 21, 2012 marks the 100th Anniversary of Houdini's most famous escape, The Water Torture Cell. The article below was originally posted to my blog on Jan 2, 2011 and I'm reposting it now for those that missed it. My take on this is that there were more than 2 Water Torture Cells. 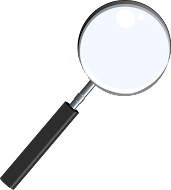 I'm also researching a new lead for more information on this topic, so perhaps down the road I'll have some new information to share. 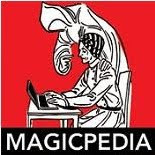 The USD or The Water Torture Cell or Houdini's Original Invention, whatever you call it, this is one of the most unique escape illusions in all of magic. It's also one of the most copied since the time of Houdini. Many performers have built their careers with this effect. 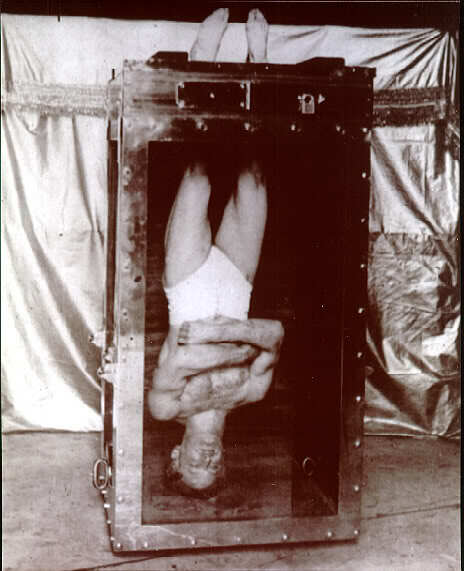 In the Patrick Culliton book 'Houdini-The Key' he mentions that there were two Water Torture Cells. This was something I had never known. But imagine my surprise when I heard recently that there were as many as four. The person I heard this from said he sold the cell in the 1980s and so far the only thing I've turned up has been a fabricated mock-up and not an original cell. Being able to turn up proof of more than two Houdini cells has not worked out so well. However, let's get back to the two cells that Pat mentioned. I think there is photographic proof of two cells and if you look carefully in the following photos I'll point out why I think we are looking at two different Water Torture Cells. This image is a classic. 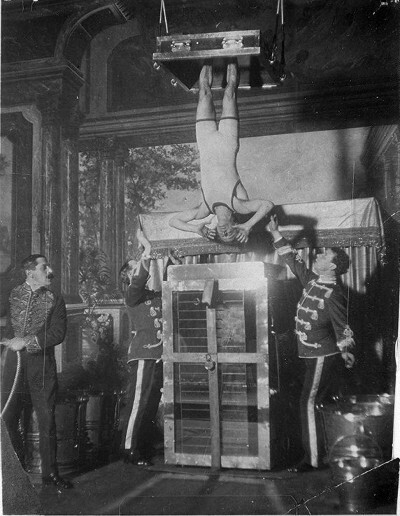 Houdini hanging in the UP-SIDE-DOWN Water Torture Cell or USD, as he called it. Notice the stocks. Patrick Culliton points out in his book that the yale lock in the front of the stock was added for the photo. However, I don't think so. These are different foot stocks altogether. They are missing handles, they are missing the metal trim on the sides and they are even missing the four corner circles that were used to hook cables to raise the stocks and Houdini in the air. Now check out this photo. I believe this photo was taken after the clean-up that John Gaughn did to the cell but prior to it's destruction in the fire of the Niagara Falls Museum. Notice the evenly spaced rivets along the top of the frame. Also notice that the glass in this photo is much narrower than the photos above. The glass is as wide as the cage in the upper photos. But in the cage photo the glass extends beyond the edges of the cage several inches. 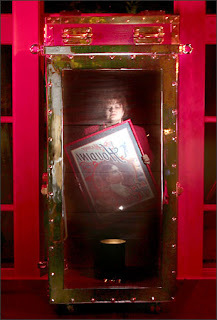 This cell to the right is the one that went into the Houdini museum in Niagara Falls and was later destroyed in the fire. The remnants of this USD were used to build the recreated cell that sits in David Copperfield's museum. Next compare the foot stocks in the photo directly above and the color photo to the right. Specifically look at the space to the left and right of the handles on the stocks. You'll see in the upper photo the space is wider than the photo to the right. More proof the upper cell was a wider cell. To me it's pretty strong photographic proof of two different cells, but trust me you've really got to stare at these things to see the differences. The two cell photos at the top are of Cell #1, the color cell photo is Cell#2. Oh, if you are wondering what happened to the cages that went inside the Houdini USD, according to Sidney Radner (via John Cox's Site WildAboutHarry.com) they were lost while in Henry Mueller's possession. Patrick Culliton says that the second cell deteriorated in the backyard of Bess's sisters house. Though I honestly think the cell that deteriorated was probably 'the first/wider/original'. Sid Radner received a later version of the cell. We know that Hardeen was considering rebuilding the second cell to train Sid but that cell would have to have been slightly larger to accomodate Hardeen. There is a famous photo of Hardeen and Sidney Radner standing next to the USD and they both dwarf this small cell. But my mind does keep going back to the idea that there might have been more than two cells. I've certainly seen photos of at least three Houdini milk cans. So maybe there is a third Water Torture Cell out there somewhere. The next question is, what on earth does someone do with one of these things if it isn't being used or on display? I know Steve Baker's Water Torture Cell is gone. Who has it? No idea. It too was unique enough that if someone else performed with it it could be identified. Other people have performed the USD over the years with their own cells, are there just dozens of these things sitting in storage units all over the country??? 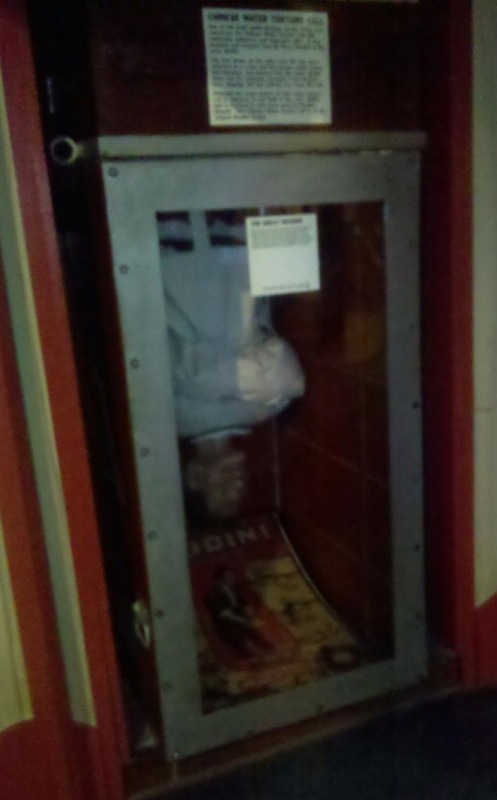 The supposed third Water Torture Cell I was told about was sold to a museum in Nashville and later moved to Gatlinburg TN and still sits on display. However, the only USD I could turn up in Gatlinburg is this one at the Ripleys/Guinness Museum, and it's clearly not an original. (see side photo) Take a moment and read what is printed on the card that is stuck on the upper part of the cell. 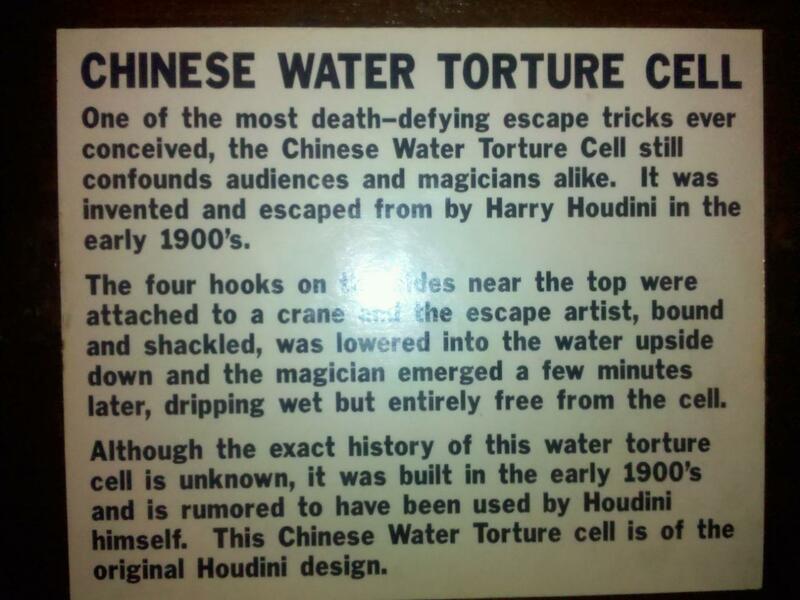 The last paragraph says "Although the exact history of this water torture cell is unknown, it was built in the early 1900s and is rumored to have been used by Houdini himself." This WTC is even smaller in height than the others. The hardware on it is clearly modern. IF for some reason it was real, only the lower portion could be as the stocks are also very obviously made of modern plywood. I want to thank my friend Terry Evanswood for his help in searching this out and for taking the pictures. Still, I'm holding out hope that a third one shows up someday as it would be almost like the holy grail of magic props. If anyone knows the location of ANY Water Torture cell, original or otherwise, please let me know. If there is a third Houdini cell out there I'd love to find it. I'd also like to find what happened to Steve Baker's WTC. His cell was nearly 7ft tall when the stocks were put on. It was massive compared to Houdini's and I know it's been out of his possession since the early 1990s. And where is Doug Henning's WTC today? I know Brett Daniel's owned it for a time but I don't think he has it any more. I have a theory on this too that I may share eventually. Excellent work! You know, it's ALWAYS troubled me that the cell in those earlier pics just looks bigger. And it's not just a trick of perspective. In the photo of Houdini onstage in his full evening show we see the cell behind him, and it's clearly the smaller cell we know today. Have you ever contacted Steve Baker to ask him about his WTC? He has a website and a Facebook page. I would also love to know what happened to Henning's cell. BTW, my buddy who works in the Warner Bros. archive says they have a cell there, but he's not sure what movie it's from.